Amberjack and Red Snapper season is here! Trips are getting booked fast, so act now! Charter Boat Shark provides anglers with a genuine fishing experience they won’t soon forget! Let us take you out on one of our twin 41-foot charter boats, so you can reel in the catch of a lifetime. We have more than 35 years of experience in the local waters and employ Coast Guard-licensed captains. When it comes to a fishing charter you can count on, come fish with us! Have you always dreamt of reeling in a fighter—a trophy-quality fish that you hook and land all by yourself? For many, it’s a dream come true when it finally happens! It’s not every day you get the opportunity. At Charter Boat Shark, it’s our mission to provide you with that chance! We sail daily fishing charters from Sarasota, FL, taking anglers out into the Gulf of Mexico to test their luck against the many different types of fish these waters have to offer. Time and time again we get to see the excitement and happiness of fishermen who land a prized catch, and we never get tired of helping to provide that opportunity. If you’re looking for a fishing charter in Sarasota, FL that will help you have a once-in-a-lifetime experience, we’re the ones to call. Our charters are geared for success, right from the get-go. We sail twin 41-foot charter boats that are fully equipped with the best in fish-finding technology. Plus, our captains are extremely familiar with the waters and fishing practices of the area—meaning we can always advise you on the best ways to drop your line in the water. Best of all, we know all of the local fishing destinations, no matter the season. Our specialty is making youngsters into true fishermen, so if you’ve got a budding angler and are looking for a fishing charter for hire in Sarasota, FL, don’t be afraid to give us a call! We invite you to charter a fishing trip with us and experience an excursion you’re guaranteed to remember. Born and raised in Sarasota, FL, Captain Gus Loyal is an expert navigator and knows the local waters better than most. We know where to find the fish! We have all of the necessary Federal permits for offshore fishing and take pride in operating a legitimate charter that’s in complete compliance with regulations. We operate 2 identical charter boats, to maximize your experience out on the water. 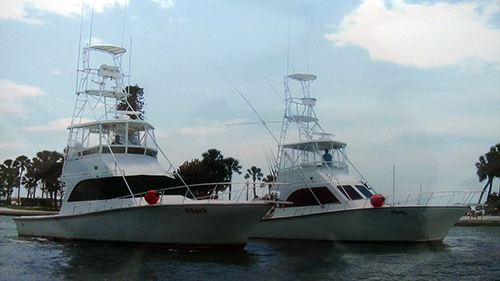 Shark and Shark2 are identical 41-foot custom built sport fishing boats. Our charters are the perfect place to get young anglers interested in sport fishing. We welcome new fishermen of any age! Our charters range from 4-hour ventures, to extended all-day charters that can span as long as 10-11 hours. Ready to explore the deep waters of the Gulf of Mexico and reel in a prized catch on a once-in-a-lifetime fishing excursion? Contact Charter Boat Shark to make it a reality!